Sometimes, being typecast isn’t necessarily a bad thing. It was typecasting that brought audiences a decade of classic action films from Arnold Schwarzenegger. Breaking out of that mold brought more financial success, to be sure, but crossover Arnold never felt like the real thing. He felt sanitized for mass consumption. This is an oversimplification, of course, but the Arnold that was in Junior, the anonymous and final film he worked on with director Ivan Reitman, could not have been more out of place. Arnold stars as De. Alex Hesse, a research scientist who, along with Dr. Larry Arbogast (Danny DeVito), is developing a new drug intended to prevent miscarriages. Things are going well for their project right up until the moment the FDA refuses to allow human trials. Science cannot be stopped, however, so Arbogast hatches a plan to test the drug on Hesse. The plan is outrageous. Hesse will have a human embryo implanted in his peritoneal cavity. Afterwards, he will take large doses of both the experimental drug and estrogen. After the first trimester passes, the two should have enough data to halt the experiment. Only, predictably, Hesse becomes enamored with the idea of being a parent, and decides to keep the child. Did I mention that this is a comedy? Because it is. It is a joyless example, rote and formulaic, but it is a comedy nevertheless. Hewing to formula as it does, that means Arnold needs a love interest. The duties fall to Emma Thompson, playing a bit of a flaky scientist by the name of Dr. Diana Reddin. She gets the hots for Hesse at first sight, and does her awkward best to get to know him. Her introduction to the film showcases her character’s clumsiness in a witless bit of slapstick that fits right into the film’s general tone of blandness. This is the third film Reitman directed with Arnold, and I’m having a hard time reconciling that this milquetoast run came from the same director that helmed Stripes and Ghostbusters. I don’t know. Maybe he had kids and turning soft was a natural result. Maybe the money from Twins removed any desire to test his limits. Or maybe it had something to do with these films not having Harold Ramis’s name on the screenplay. 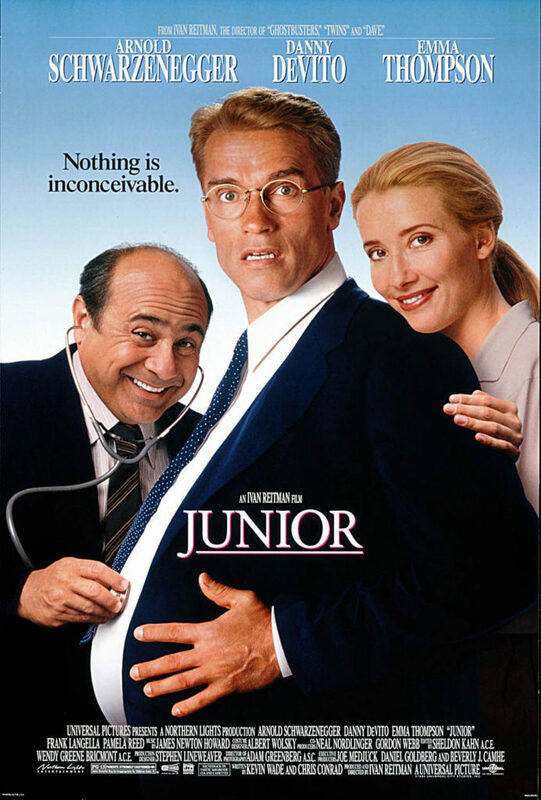 Whatever the reason, the extreme wholesomeness of Twins, Kindergarten Cop, and now Junior, comes with the cost of removing any sort of edge to the films. The filmmakers seem to think the best way to moviegoers’ wallets is making films for people who have no developed sense of taste, whose experience of film is limited, who have never challenged their sensibilities nor sought out films that would do so. At least, that seems to be what the filmmakers think of their viewers. If these films were a rejection of nonconformity, an attack on over-exuberance or a response to things in our culture that ail us, I could find something in them to respect. But they are not. They are a happy meal writ large on the big screen — yet another reminder that Hollywood believes its customers lack sophistication. Sit back and enjoy, America. The funny thing is, though, Junior is not a stinker. It’s probably the worst acting I’ve seen out of Arnold in this long month of going through his oeuvre, for half of this performance, but there are moments when human feeling begins to work its way in, like a splinter digging itself deeper into one’s skin. This may have been a role where more could have been gotten out of Arnold. He always feels like he’s just on the cusp of nailing it. Had he been able to convincingly portray a hulking man-mass going through a wildly hormonal pregnancy without being too repugnant towards women, this film would have been good. But walking such a fine line was never in the cards. Every film star has a role in their filmography that fades away, lost to time because it holds zero significance to either theirs, or the industry’s, legacies. For Arnold, this is one of those films.